OSWEGO, NY – Before the 2012 edition of Grand Prix Night at Oswego Speedway, Mike Bond had 26 career SBS wins to his credit. None of those previous wins however were likely as memorable, or long lasting, as his last lap heroics on June 30 of last season. After running the consi as a result of a heat race accident, the No. 26 of Bond started 18th on the grid for the main event, and proceeded to climb his way through the field on his way to passing JJ Andrews coming out of the final turn nipping the No. 93 by .001 seconds. 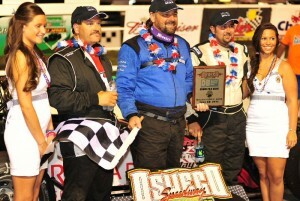 Mike Bond (center) edged JJ Andrews (left) to win the closest finish in SBS history last June ahead of Tim Barbeau (right). Career win number 27 for Bond will go down as the closest official feature finish in Speedway history since the inception of AMB digital scoring at the Speedway in 2005. 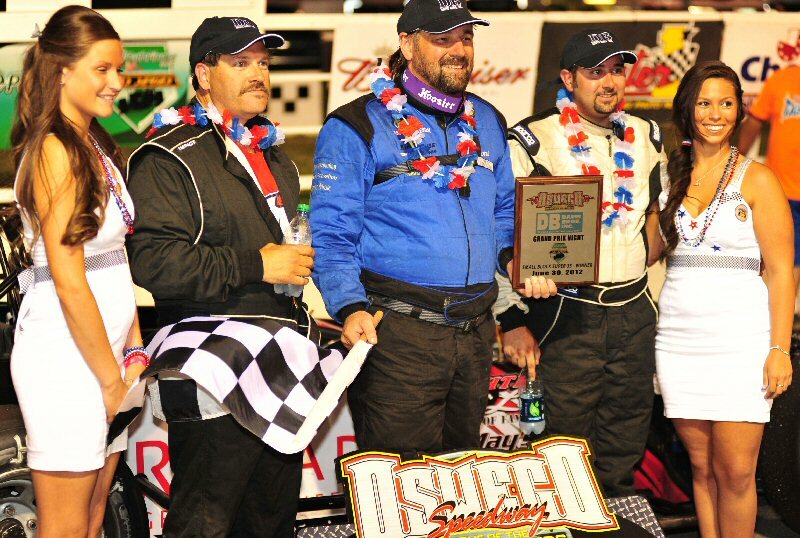 In the overall 62-year history of Oswego Speedway there was one scored tie, or “dead heat,” coming on June 28, 1997, between Ed Bellinger Jr. and Doug Didero. At that time races were still hand scored, and a photo finish was used to determine the winner. Tim Barbeau, Jason Simmons, and Kreig Heroth would complete the Top 5 finishers in the Pathfinder Bank SBS Series main. SBS Rookie Josh Kerr and long-time veteran John Ketcham led the SBS field to the Cam’s NY Pizzeria green flag with rookie Kerr gaining the early edge in the No. 8. Andrews, who started 3rd in the order, made quick work of Ketcham to get to 2nd followed by Andrew Schartner in the No. 18 to 3rd. With the field in a good rhythm Kerr, Andrews, Schartner, Barbeau and Mark Castiglia all lined up nose to tail in front of the field on lap 20. Kerr, a graduate of the Oswego Kartway, looked smooth in the race lead ahead of veterans Andrews and Schartner. By the 23rd circuit Bond was really making moves through the field in a battle with Simmons for the 6th position. At the same time 5th running Castiglia broke and pulled to the pit area allowing Simmons and Bond to gain one more spot each. As the field approached just five laps to go the Kerr No. 8 continued to lead the pack, as he had done since the drop of the green. Andrews and Schartner began to press harder and harder, which Bond could see. With five to go Bond was finally able to make the pass on Simmons, but his most important pass would come on lap 32 as he made his way passed Barbeau for 4th. The pass would prove crucial as on lap 33 Andrews made a daring low side move on Kerr to take the races lead into turn three. The No. 8 of Kerr washed high leaving room for Schartner as well, but the two cars touched resulting in Schartner sliding up and over the top of the motor of the Kerr machine ending the night for both drivers. Kerr, who drove a brilliant race for 32 circuits, would have to head pit side ending his day. With Bond passing Barbeau on lap 32, he would now restart on the back bumper of Andrews with just two laps to go. When the race came back to green Andrews initially pulled away but Bond managed to close right back in at the white flag. As the two drivers came out of turn four on the final lap, Bond pulled low and managed to squeeze passed Andrews for the .001 second win. Tim Barbeau continues to have a banner year in the SBS division. Rob Pullen, Jack Patrick, Dalton Doyle, Ketcham, and AJ Bernys finished the Top 10 overall.